The American Bulldog is a powerful, athletic, medium-large sized dog with great muscular strength and endless endurance. 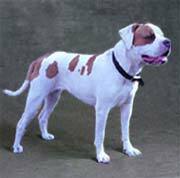 There is a wide size and weight latitude in the breed, which vary according to the type (Johson, Scott, Painter/Margentina, Old Southern Whites type or hybrid) but overall the american bulldog is always "well balanced". Exaggeration of any part of the dog would reduce his effectiveness at work. It was first registered as American Pit Bulldog with the NKC, but was later renamed to the American Bulldog to avoid confusion with the American Pit Bull Terrier. - min. 50% white with patches of color (any shade of brindle, brown, tan, red, ...) or solid white. not allowed: solid sable, black, black-and-tan, black-and-liver, merle, St. Bernard red and fawn with black mask. are said to not wait for a command but assess the situation themselves and react appropriately. The Bulldog shares its history and ancestry with a number of other bulldog breeds . It also inspired a number of breeding programs some of which resulting in new rare breeds. The very existence of these bulldog breeds/breeding programs shows the impact the Bulldog has had in the canine world. The following books are recommended by Bulldog Information. Some of the books may be out of stock put are occasionally available as used books. Just click on the cover for more information.